Front and rear radial tire offerings are available on all models, except for the front tires on the open-operator station (OOS) configurations. To further the versatility and efficiency of the 6E Tractors and their hydraulic capabilities, the 6Es can be ordered loader ready. Being able to add a loader to a 6E Tractor makes it an even more capable solution to the various tasks a utility tractor is challenged with. 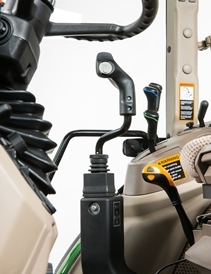 For the operator wanting to install a loader on a tractor, two-function and three-function hydraulic mid-mount valves with mechanical joystick are available. NOTE: To field install the single-function lever controls (both two and three function) please refer to the Loader Sales Manual and Price Pages. Includes: two-function mechanical joystick, four hydraulic hoses from mid-mount tractor valve to loader mounting frame, individual quick couplers, H-Series Loader mounting frames and hood guard. NOTE: Loader component of quick couplers are ordered with loader. Includes: three-function mechanical joystick, six hydraulic hoses from mid-mount tractor valve to loader mounting frame, individual quick couplers, H-series loader mounting frames and hood guard. All John Deere 6E Series Tractors feature the reliable and proven 4.5L (275-cu in.) engines. These engines deliver constant power over a wide range of rpm with a power bulge above rated power and excellent torque characteristics. 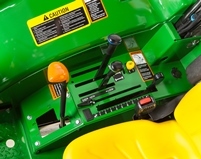 The 6E Series, while being value-featured and competitively priced, are built with John Deere's long-standing reputation for reliability, durability, and maintainability. Rated engine horsepower ratings are included for reference to competitor's gross or engine-only power ratings. 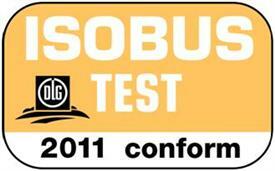 There are several ratings systems used by other manufacturers. 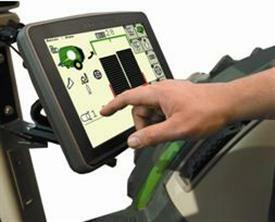 John Deere uses the horsepower-rating standard 97/68/EC, which is widely used in Europe for various regulations. 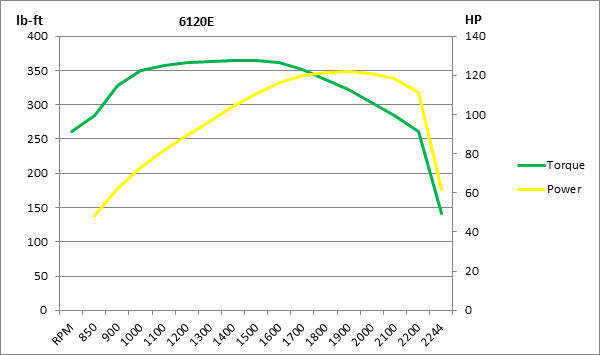 How is engine-only rated and maximum power determined? 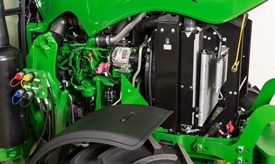 John Deere engineering uses a precise procedure to measure engine-only power levels. The 97/68/EC standard is required in the European Union (EU) as an emission test, so there is some relation to the power a tractor has as a whole functioning unit; however, the procedure requires only that a production engine and radiator are used on a dynamometer test. Use the 97/68/EC horsepower ratings in the above chart to compare to competitor claims of engine-only power. The John Deere exclusive single-injector control, electronic fuel injection system, and other key engine parts, work together to sense engine load and instantly respond as needed to pull through tough spots. This reduces engine rpm fluctuation resulting in the reduced need to downshift the transmission. 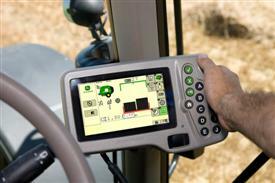 Fewer shifts result in fewer ground variations, providing more overall tractor productivity. To match the engine power characteristics and improve economy of operation, the rated engine speed is 2200 rpm. Precisely matched to the power level and application, the 6Es are equipped with a wastegate (to divert exhaust gases) turbo. Most efficient method of cooling intake air to help reduce engine emissions while maintaining low speed torque, transient response time and peak torque. Enables the engine to meet emission requirements with better fuel economy and the lowest installed costs. 4.5 L (276 cu in.) 4-cylinder. Monitors critical engine functions providing warning and/or shutdown to prevent costly engine repairs; eliminates need for add-on governing components; all lowering total installed costs. Factory-installed engine-mounted ECU, wiring harness and associated components; industry standard SAE J1939 interface which communicates with other vehicle systems, eliminating redundant sensors and reducing vehicle total installed cost. 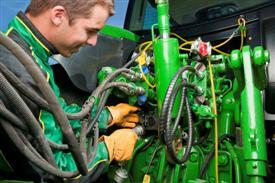 John Deere engines are designed and manufactured to deliver excellent reliability. 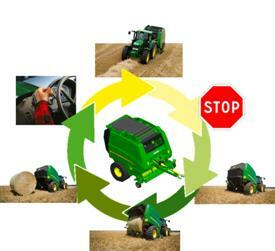 The recommended service intervals of the engine should be coordinated with the tractor service intervals. Bore x stroke 4.7 x 5.0 in. 4.7 x 5.0 in. 4.7 x 5.0 in. The 6E Series PowrReverser transmissions deliver unmatched performance. This transmission is ideal for working in tight areas where forward to reverse shifting is a primary occurrence such as in barns, feedlots and loader applications. Customers who are operating power take-off (PTO) implements like a rotary cutter or baler will appreciate the additional working speeds with the 24F/12R speeds PowrReverser transmission. High and low buttons are used to make fine adjustments in speed without the need to use the clutch delivering improved productivity. The PowrReverser transmission is base equipment providing 12F/12R speeds. Six well-spaced ground speeds place the operator in the important haying or rotary cutter range of 8 km/h to 20.9 km/h (5 mph to 13 mph). With this transmission, the operator can reach a top speed of 31.5 km/h (19.6 mph). The optional PowrReverser transmission 24F/12R will deliver 11 well-spaced ground speeds to match the correct speed for a haying or rotary cutter application with a top speed of 40 km/h (25 mph). A dash-mounted PowrReverser modulation kit (LVB25727) is available to set the aggressiveness of the forward and reverse shuttle modulation that best fits the application or the operator's comfort level. Two levers, one for speed and one for range, with the addition of an electrohydraulic left-hand reverser, provide operators optimum control and maneuverability. Range lever (right-hand side [cab], left-hand side [OOS]) selects four ranges (A, B, C, D). Gear selection (right-hand side) selects speeds (1, 2, or 3) in the forward or reverse direction. 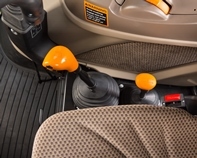 Electrohydraulic left-hand reverser allows for quick and convenient shuttle shifting between forward and reverse at any speed. High and low buttons are located on the gear shifter for the 24F/12R PowrReverser transmission. All speed gears (1, 2, 3) are fully synchronized for shifting-on-the-go capabilities, putting less wear on the operator and saving time in the field. 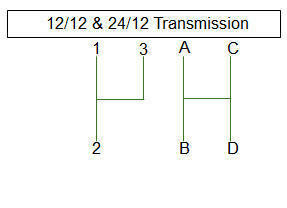 In the 12F/12R PowrReverser transmission, gears are synchronized for low shifting effort while the operator is doing field or loader work and during transport. 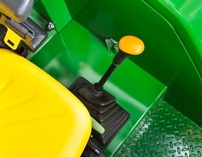 The high and low speeds on the 24F/12R PowrReverser transmission can be shifted without clutching while the tractor is under load. 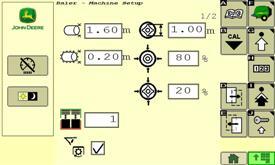 This makes for quick speed changes when operating a rotary cutter or baler. 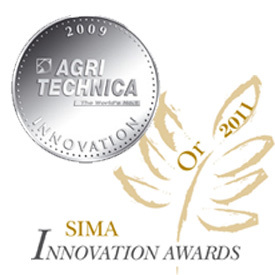 To further enhance awareness of reverse tractor motion, a backup alarm can be field-installed (BSJ10026). The ranges (A, B) are not synchronized. 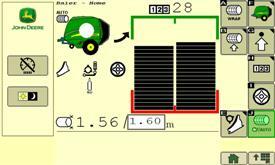 This means the tractor must be stopped for the operator to select the range. However, with operator input, the speeds have been well spaced out to minimize the need to change ranges within applications. The ranges (B to C, C to D, and D to C) are synchronized. That allows the operator to shift ranges on the go in transport and high speed applications like operating a mower-conditioner. John Deere has led the industry in the innovation of wet clutches. In this wet-clutch design, five 17-cm (6.7-in.) diameter clutch disks provide optimum clutch modulation for smooth operation; the disks are oil-cooled for a lifetime of service. The biggest advantage of a wet clutch is its ease of use as the required force to depress the pedal is minimal. 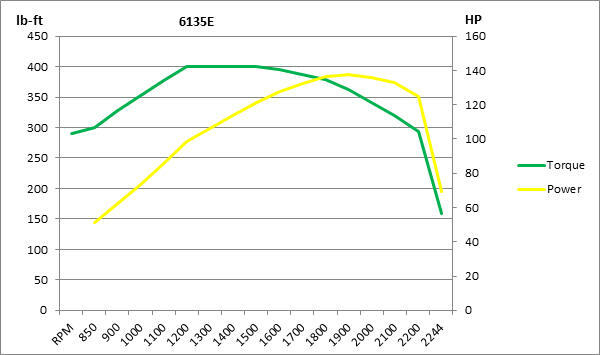 Also, with a wet clutch, the need for frequent adjustment and clutch mechanism changeover is eliminated. 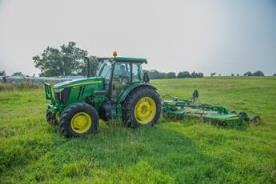 on new John Deere 6E Series Utility Tractors.